Is Heaven going to be a place for murderers? Let’s plunge into the Deeper Waters and find out. For the atheists that share this online, this seems unthinkable. God will allow a murderer to be in Heaven? He will not only allow a murderer to be in Heaven, but the people he murdered or whose loved ones he murdered will have to spend all eternity with this person? What kind of God is this? At the start, it looks like for the atheist, you can’t win for losing. I’m not going to really debate on the view of Heaven presented here, but consider that if God sends people to Hell, well he’s wrong for doing that supposedly. If He snuffs them out of existence, well that’s pretty cruel. He’s wrong for doing that. 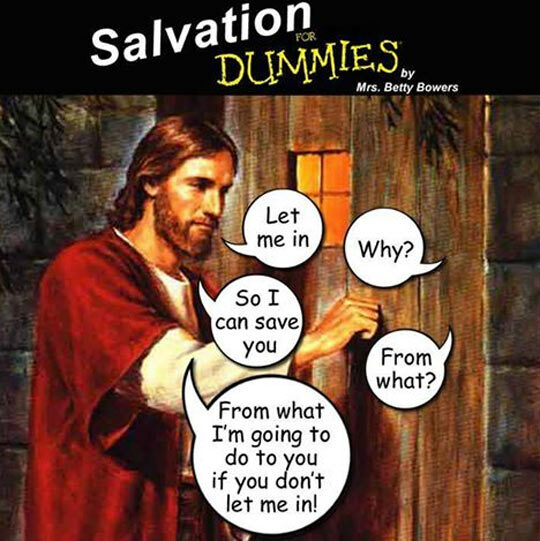 If He lets them into Heaven, well look. People have to spend eternity with such evil people and they get a free pass. So no matter what, it looks like there’s an excuse to argue against God. But notice what’s going on here. It’s this assumption that you could never be happy to see someone who murdered you or a loved one of yours in eternity. What’s going on here? Years ago, Christopher Hitchens issued this challenge. A fair challenge we have been told. You don’t need God to be good. Atheists are just as good as Christians. In many cases, I can agree. The argument has never been that you need to be a Christian or a theist to be a good person or to know good from evil, but Hitchens’s challenge does say that atheists can do good just as much as you religious people can. So how about forgiving people? 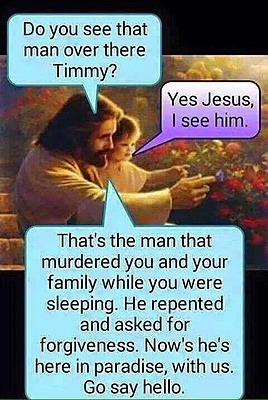 Because what atheists are assuming is that little Timmy in the above photo will be just as he is now. He will be just as prone to sinful tendencies as he is now. He will harbor hatred in his heart just as much as he is capable of doing so now. But the Christian claim is that Christ transforms us entirely. He takes away all that isn’t us. He makes us to be like Him. He makes it so that we can love those who wronged us. He reveals to us the grace we need. As C.S. Lewis would say, we forgive others because God has forgiven the unforgivable in us. And you know what? We have some real examples of that. How about Corrie Ten Boom? She was in the holocaust. Her sister died in a prison camp and one of the guards from that camp came to see Corrie and asked for forgiveness. Does someone think this is a bad thing? Steven Gahigi was able to forgive in Rwanda, even though many members of his family had been killed by genocidal people over there. Anthony Colon had his brother murdered by someone. Anthony through becoming a Christian found the forgiveness to forgive his brother’s murderer. Kent Whitaker underwent a nightmare. Not only were two members of his family murdered, but the culprit behind the crime was his own son. Kent managed to forgive his son. Why? Because of Christ. Do the atheists want to register a complaint? Bert Baker’s sister was murdered by her estranged husband. While in prison, the husband, James, came to Jesus and asked Bert for forgiveness. Bert gave it. Today, Bert and James do prison ministry together. Do you see a pattern forming here? Remember a few years ago when the media was shocked by what an Amish community did for a killer who shot some of their children in a school? They practiced that Christian virtue of forgiveness. There is also the case of the forgiveness of serial killer Gary Ridgway. Ridgway murdered several and one of the victims stood up to say he doesn’t hate Ridgway, though he’s made it hard to follow the principle of forgiveness, and yet he still gave it. Why? Because God says this is the right way to live. How about Gladys Staines? She’s the widow of Graham Staines. He and two of their sons were killed by a mob in India where he was serving as a missionary. She holds no ill-will towards the killers. What about the story of Karla Faye Tucker? She found forgiveness in Christ in prison. Who else forgave her? Ron Carlson. His sister had been murdered by Tucker. He remembers months of wishing, night and day, that he would someday have the OPPORTUNITY to kill Karla Faye; he wished he could have her at his mercy, with a pickaxe in his hands. Already having experimented with drugs, the loathing drove him deeper into the practice until his life no longer resembled what it had been before the tragedy. Strangely, as did the woman he despised, he found his faith in the Bible. Reading about the crucifixion of Christ, he realized the reality of the tests everyone is put to in this life. “I learned that if I want to be forgiven, I must learn to forgive,” he attests. Another famous story is the story of Elizabeth Elliot. It was made famous in the movie The End of the Spear. Her husband Jim, along with his companions were killed by a tribe in South America that they were trying to evangelize. Later, Elizabeth and the wife of one of the companions went to South America themselves to this same tribe. The tribe eventually became Christians and one even apologized for what was done to Jim. Would anyone object to the idea behind Desmond Tutu’s Forgiveness Project? We might disagree with some theological matters, but many of us know forgiveness is the right way to live. Blinky Rodriguez was a world champion in martial arts and kickboxing. His son was killed by gang-related activity. Rodriguez met with the killers. To punish them? No. Surely as a martial arts and kickboxing expert he could have, but to forgive them. In fact, he worked with the gangs in the area even getting a treaty that greatly reduced gang-related crime in the area. All of these tell the power of forgiveness. This is just nonsense. It’s like your only crime is not being a Christian. The reality is, God doesn’t exclude you from His kingdom for not believing in Jesus. God excludes you for all the other things that you’ve done. Even the most saintly atheist can look in the mirror and realize there are things he’s done wrong in his life and knows there are ways he needs to be improve in being a good person. The most saintly Christian can say the same thing. Believing in Jesus does grant you that forgiveness that you need. If you don’t have that, God judges you by the only thing He can judge you by. Your works. They have to meet His standard of perfection for no impurity can be in the Kingdom. Forgiveness is the solution. We are forgiven for we could never make up for what we’ve done. And this is why it’s so important we forgive one another. The stakes are serious. The Gospel destroys the gap between God and man. Whatever my fellow man has done to me, what I have done to God is far worse. If God can erase my debt, ought I not to erase the debt of my fellow man to me? If I do not, have I fully imbibed the Gospel message? Note that this does not mean that all consequences for an action are removed. There could be a debt owed to society still. Some consequences I think are built into the system. If you sleep around and get an STD and pray for forgiveness, you will be forgiven, but there is no guarantee you will be cured of your disease. David was forgiven for his sin with Bathsheba, but the child born from the relationship still died. I also encourage people for the most part to always have an attitude of forgiveness and show that forgiveness, but don’t pronounce it until someone asks for it. Why? Because you do not want to rob someone of something beautiful. Them coming to you thinking you could never forgive them and your still pronouncing that forgiveness. It will mean so much more if they ask for the forgiveness first, but you will only be able to forgive if you have already forgiven in your own heart. So as we look back at the meme again, we have to accept it. Who will be in Heaven? Will murderers be in Heaven. Yep. Will rapists be in Heaven? Yep. Will adulterers be in Heaven? Yep. Will pedophiles be in Heaven? Yep. Provided they have repented and received forgiveness, all of these people will be in Heaven. So will some of their victims who have done the same thing. They would have it no other way. Heaven is meant to be a place of unity and grace and love. It is not a place for hatred of your fellow man or pride or people who don’t forgive. If you have a problem with grace, love, and forgiveness, Heaven is not the place for you. IF you want to stay in anger and hatred towards those who have wronged you in this life, Heaven is not for you. Your every action is preparing you for one of those places more and more. Of course, the central action is how you respond to Jesus which will affect everything, but how you spend eternity wherever you are will be based largely on what your actions are. If you think a society where the chains of unforgiveness should be held onto is ideal, then Heaven is not the place for you. I’m not going to pretend this is easy. My wife Allie means everything to me. If someone hurts me, I can take it. No sweat. I’m used to it. People will be jerks. I know this. If someone hurts her, well it is on….. But you know, I know with the Gospel that ultimately, when push comes to shove, I have to forgive, even if something horrendous happens to her. I pray it never will, but I also pray that if it does, I will be able to forgive. Maybe if atheists are touting this meme like it’s an argument, it’s because we’ve found an answer to Hitchens’s challenge. Maybe that answer is that we can forgiven the unforgivable. Because you see, in the end, this meme is not an argument against Christianity. It’s an argument for Christianity. This illustrates that in the renewed Heaven and Earth, anger and animosity towards those who’ve wronged us will be so much a thing of the past, that murderers, rapists, pedophiles, and their victims will be able to walk in unison and joy together. The lion and the lamb will lie down together. And the murderer and his victim will walk hand in hand together. Because that forgiveness thing, we take it seriously. And we take it seriously because God takes it seriously. If you have a problem with that, you’re not revealing anything about Christianity. You’re revealing something about yourself. Posted on 12th June 2015 12th June 2015 Author Nick PetersCategories Apologetics, Christian Doctrine, Evil, General Christian Teachings, LoveTags Amish, Amish community, Amish Shooting, Anthony Colon, Bert Baker, Blinky Rodriguez, Christopher Hitchens, Corrie Ten Boom, Desmond Tutu, Elizabeth Elliot, forgiveness, Forgiveness Project, Gary Ridgway, Gladys Staines, Graham Staines, Hitchens's challenge, Jim Elliot, Karla Faye Tucker, Kent Whitaker, murderers, pedophiles, rapists, Robert Rule, Ron Carlson, Steven Gahigi24 Comments on Will Your Murderer Be In Heaven?